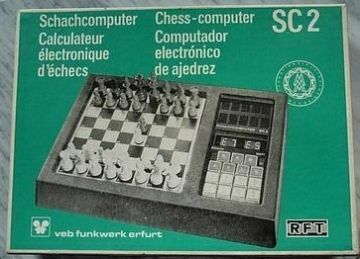 one dedicated chess computer was illegally cloned by eastern germany (GDR) and sold into the world. 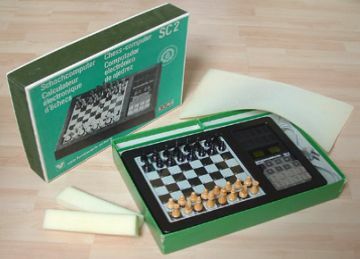 With components from eastern germany they copied the Fidelity Chess Challenger 10 (we don't know which version) and made a kind of remake of Ron Nelsons Fidelity machine. They even copied the flickering of the oooo display between odd and even plies. girl playing chess is put above the original green box picture. I wonder if ever, at least in this field, socialists countries produced an original piece of hardware. AS it is known, the Ural maiframes URSS computers were pathetic copies of IBM 360. And of course the Ylushin commercial jet was a Boeing 707 badly copied. What about east germany of those times? 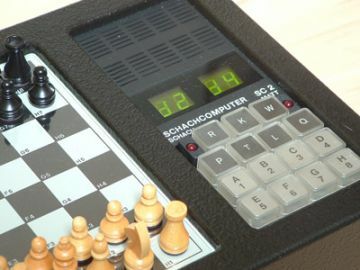 Little bit of info about East Germa chess computer manufacturer VEB Microelectronics can be found at the following link. What's my next move? - to the fridge for another beer !! 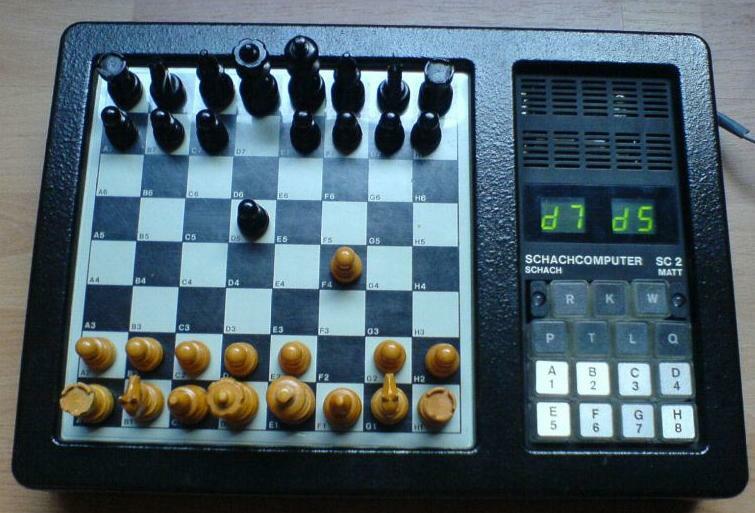 can somebody with a fidelity chess challenger 10 try replaying with the original machine ?? what level was the SC2 on? i think it was level 6.
the good thing with the SC2 is IMO the keys. they are very easy to press. more like the keys of a typewriter. much better than he sensor keys of the original fidelity machine. btw. the SC2 beeps in a cyclic number of time, similar to the "your move" of my voice. one can turn off this beeping when it is the opponent to move. is the version 10 also having this kind of beep ? or is the SC2 maybe a voice with a beep instead of the voice ? i can do another game (revenge) at the week end. 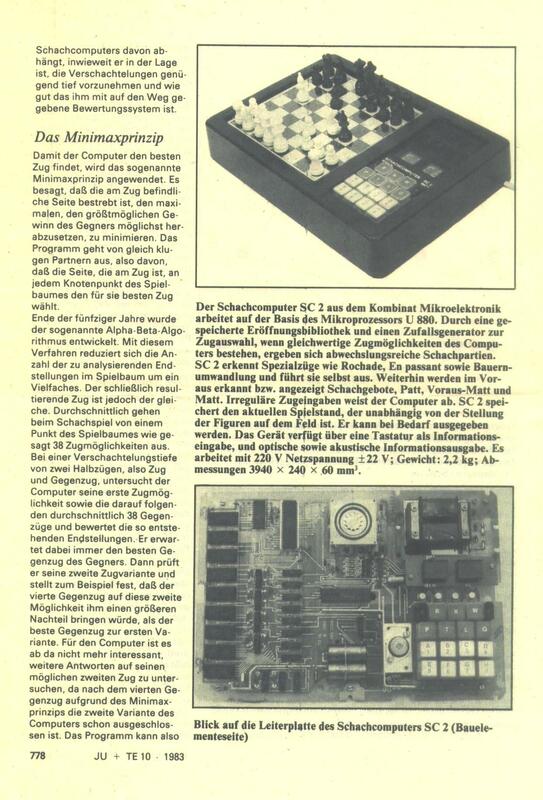 i wonder why the GDR version has green LEDs. green LEDs versus red LEDs. i think i do have the 2.5 mhz version. mclane wrote: i think it was level 6.
when it is the opponents time, SC2 beeps after a few seconds or minutes. this is IMO similar in the VOICE, the fidelity voice repeats after a while that you should move, that it is YOUR TURN to move. i do not exactly remember what my fidelity voice says, but it makes a comment after a while. instead of talking the SC2 beeps. i wonder if the Fidelity 10 do also beep after a while when they are awaiting opponents move . of course the machines have a normal beep that happens when you press a key or when the machine moves. i am referring to the beep that comes when you do nothing. the two closest level's for the CC10 would be level 9..which is 6 minutes per move or level 10 which is 3 minutes per move?